Gives an uninterrupted impression of the size and strength of the market movements. The trader can set the bands based on his own preferences. Discreet position at the bottom of the charts. Allows the trader to scale his chart differently every day and still compare market movements. The heatmap, which can be added to the bottom of the chart, will show the first band as white, the second band as green (red) and the third band as dark green (dark red). The colours give the trader a quick visual overview of the evolution and the size of the market movements. 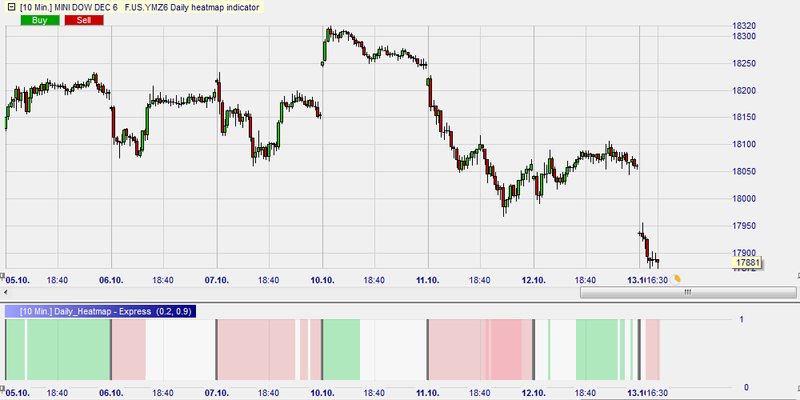 This example shows the DAX future over 5 days. The heatmap bands have been set to the values given as the example above. On only 3 occasions did the DAX future move more than 0,60%. This example shows a 15-minute chart of the DOW future covering one day (note: the day is not yet finished). By fitting the chart to the screen, the initial candles look big. The heatmap, however, informs the trader that only on two occasions the DOW moves into the second band (0,20% - 0,60%), indicating a medium market move. This example also shows a 15-minute chart of the DOW future covering one day. By fitting the chart to the screen the trader has the false impression that the market move is similar in size to the move in the previous example. The heatmap, however, informs the trader that from the opening the movement was bigger (no white, immediately into red). It also indicates that the market on three occasions moved more than 0,60% (dark red).